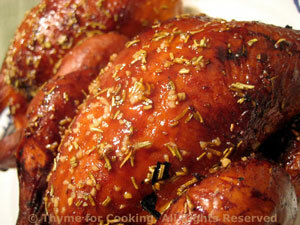 Cornish Hens with Lemon, Honey and Rosemary Glaze, Thyme for Cooking. If you can get them weighing 16oz they are perfect individual servings (with maybe a snack leftover). If you get larger birds one may be enough. When done, they should have a lovely, dark gold glaze. Rub birds with 1 tsp of the oil. Cook on barbecue grill over indirect heat (either charcoal or gas), covered, for 45 - 60 minutes, depending on size or until done, basting half-way through. Poultry is done at 160 F (70C) on your meat thermometer and/or the juices run clear when pierced with knife. In a small bowl mix remaining oil, lemon, mustard, honey, rosemary and garlic. During last 30 minutes of cooking baste with sauce 2 or 3 times. When done, remove and serve - don't forget finger bowls (it's messy) and bone bowls (to keep your plates tidy).